Katherine J. Hornback, born in Lexington, Kentucky, April 5, 1969, admitted to the bar, 1995, Kentucky; also admitted to practice before the U.S. District Court, Eastern and Western Districts of Kentucky and the United States Court of Appeals for the Sixth Circuit. Ms. Hornback obtained her B.A. in Political Science/English from Miami University in 1991, and her J.D. from the University of Kentucky College of Law in 1994. 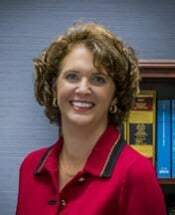 She is a member of the Fayette County and Kentucky Bar Associations, the President of the Kentucky Defense Counsel, past President of the Fayette County Young Lawyers Section, and is past President of the Kentucky Young Lawyers Section. She served on the Board of Governors for the Kentucky Bar Association. She is a Fellow of the American Bar Foundation. In 2003 she received the Outstanding Young Lawyer Award from the Fayette County Bar Association. Reported cases: Dailey v. American Growers Ins., 103 S.W.3d 60, (Ky. 2003); Bradford v. Lexington Fayette Urban County Government, 2005 WL 327177 (Ky. App. 2005). Her areas of practice include employment, insurance defense, personal injury and general civil litigation.